The ACES competition team placed second in the Mid-Atlantic Collegiate Cyber Defense Competition (MACCDC) behind the University of Maryland, Baltimore County on March 28. Towson University finished in third place. MACCDC is a “inherit and defend” competition, where each team is given a network infrastructure representing a company’s network. This year, the teams were given a metropolitan transit system following the theme, Operation Transit Storm. Participating teams try to find flags in their systems, defend their system from the red team, the “Hakistan army,” keep their services running and comply with customer needs. During the competition, teams are scored on their customer service availability, number of flag captures and business injects. The Mid-Atlantic region held a qualifier round with 33 competing teams, 10 of which advanced to the regional competition. ACES placed first in the qualifying round, with the challenges very similar to those at regionals. The ACES team that participated in MACCDC included ACES sophomores Max Grable, Jeremy Krach, Kevin Bock, Toby Lin and Michael Ekstrom. ACES freshmen Patrick Freed, Danny Beck and Andrew Jordan were also part of the team. The competition team represents the University of Maryland in almost every major competition in the area, including the National Cyber League and the Maryland Cyber Challenge. The competition team began in Fall of 2013 and is now in its second year with more than 30 members. “With the second cohort of ACES students is really when things started moving. We've done more competitions and it’s kind of been more of a cohesive group just cause we’ve had more people,” said Michael Ekstrom, an ACES sophomore. “We have been able to meet in the ACES lab in the same building we live in which is a huge benefit. It makes things a lot easier." 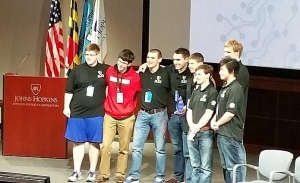 As winners of the competition, University of Maryland, Baltimore County competed in the National Collegiate Cyber Defense Competition April 24-26 in San Antonio, Texas. Learn more about the ACES Cybersecurity Competition Team in this video.